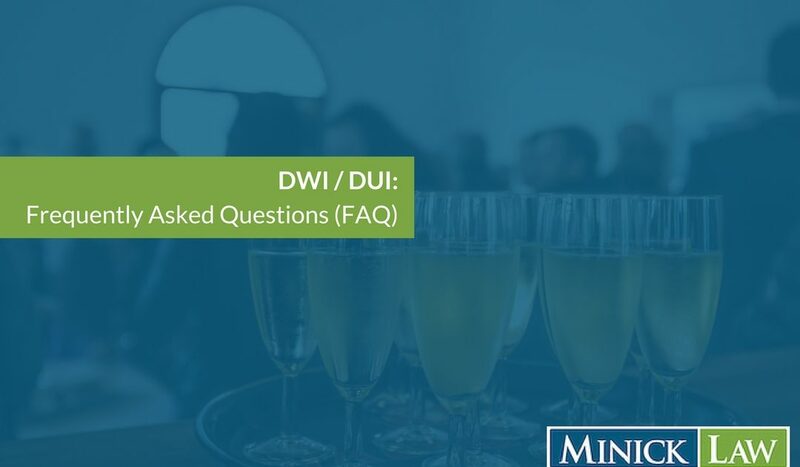 The following is a collection of frequently asked questions that many of our clients asked regarding a Driving While Impaired (DWI) charge. Although this is a large list, it is be no means a definitive list of all questions regarding a DWI charge. If you have been charged with a DWI, don’t hesitate to Contact Us for a free consultation on your DWI charge. What is Driving While Impaired (DWI)? Driving While Impaired (DWI) is the formal name for the charge of driving a motor vehicle while drunk. It can sometimes be referred to as Driving Under the Influence (DUI), but in North Carolina, the official charge is a DWI. Operating a motor vehicle on a public street, highway, or public vehicular area with a Blood Alcohol Concentration (BAC) of 0.08% or above. Operating a motor vehicle while alcohol, drugs, or a combination of drugs and alcohol impair your mental and/or physical abilities, even though your Blood Alcohol Concentration (BAC) does NOT rise to 0.08%. Operating a commercial motor vehicle on a public street, highway, or public vehicular area with a Blood Alcohol Concentration (BAC) of 0.04% or above. I’ve been charged with a DWI, do I need a lawyer? What are the various sentencing levels for a DWI in North Carolina? In North Carolina, there are six levels of punishment for a DWI. They rank in descending order of seriousness from Level 5 (most lenient) to Aggravated Level 1 (most serious). These levels are determined during a sentencing hearing following our trial. If the defendant is placed on probation, the defendant must obtain a substance abuse assessment and the education or treatment required for the restoration of a driver’s license. Level 2 DWI is more severe than Level 3. To find a Level 2 DWI, the Judge must find that there was one grossly aggravating factor. The Judge does not weigh aggravating and mitigating factors, except if they affect how much of a punishment he will give under the Level 2 punishment guidelines. A defendant subject to Level Two punishment may be fined up to $2,000 and may be sentenced to a maximum term of not more than 12 months. The term of imprisonment may be suspended only if it requires the defendant to serve a term of imprisonment of at least seven days or to abstain from consuming alcohol for at least 90 consecutive days. If the defendant is placed on probation, the defendant must obtain a substance abuse assessment and the education or treatment for the restoration of a driver’s license. The judge may impose, as a condition of probation for defendants subject to Level One or Level Two punishments, that the defendant abstain from alcohol consumption for a minimum of 30 days, to a maximum of the term of probation, as verified by a continuous alcohol monitoring system. Level 1 DWI is more severe than Level 2. To find a Level 1 DWI, the Judge must find that there was a passenger under the age of 18 in the vehicle or that there were two grossly aggravating factors. A defendant subject to Level One punishment may be fined up to $4,000 and may be sentenced to a maximum term of not more than 24 months. The term of imprisonment may be suspended only if it requires the defendant to serve a term of imprisonment of at least 30 days. A judge may reduce the minimum term of imprisonment required to no less then 10 days if the defendant abstains from alcohol consumption and is monitored by a continuous alcohol monitoring system for no less than 120 days. The defendant must obtain a substance abuse assessment and the education or treatment for the restoration of a driver’s license. Aggravated Level 1 DWI is the most severe misdemeanor DWI level. If a Judge finds three or more grossly aggravating factors, the Judge will sentence the driver to an Aggravated Level 1 punishment. A defendant subject to Aggravated Level One punishment may be fined up to $10,000 and may be sentenced to a term of imprisonment of not more than 36 months. Probation may be granted only if it requires the defendant to serve a term of imprisonment of at least 120 days. If probation is granted, the defendant must abstain from drinking alcohol for a minimum of 120 days while undergoing continuous alcohol monitoring and obtain a substance abuse assessment and the education or treatment required for restoration of a driver’s license. What are the statutory factors for a DWI? Will getting a DWI effect my employment? This is a hard question to answer since every situation is different. As a fact, a DWI or any other arrest is public record in North Carolina. It will remain a public record unless you get it expunged. As such, anyone who wants to can look and see who has been arrested or received a DWI. Since North Carolina is a Right to Work State, employers can fire their employees for any reason, as long as it is non-discriminatory, like being arrested. For the most part, people aren’t typically fired over a DWI. However, if you are fired, you may not have any legal remedy at your disposal. How you choose to handle a DWI or arrest is up to you. In some situations, it may be smart to just address the problem and inform your employer about the situation. However you choose to do this, be sure to take responsibility and show that you are working on resolving the situation. I was never read my Miranda rights, does that mean my case will be dismissed? No. Although you may not have been read your Miranda rights, this does not mean that your DWI case will be dismissed. However, what it does mean is that anything that you said between the time of your arrest and the eventual reading of your Miranda rights will be inadmissible at trial. Do I have the right to speak to an attorney before providing a blood or urine sample? Yes. In North Carolina, an individual who is being compelled to implied consent testing has the right to consult with an attorney before being tested. This right however does not allow a delay in testing. Once an individual has been notified that they have the right to speak to an attorney, the individual has 30 minutes to find and contact an attorney. However, once that 30 minutes is up, the driver will be tested. The reason behind this policy is that the longer the delay, the less accurate the test will be in determining impairment. Can I be arrested for a DWI even though the vehicle was not moving and in park? Yes, a person can be arrested for a DWI in a non-moving vehicle that is in park. Under North Carolina law, a person can be charged for a DWI as long as a vehicle is under their control. This means that regardless of whether the car was moving or not, the person could still be considered in control of the vehicle if they were in the driver’s seat with the motor on. Can I get a DWI on a bike? Yes, an individual can receive a DWI while riding a bike. Under the DWI statute, one the elements only states that a person must have been “driving a vehicle.” Under NC law, a bike is considered a vehicle for DWI purposes. I refused to take a chemical analysis test and lost my licenses for a year, is there anything I can do to get it back sooner or get a limited driving privilege? The DWI of which the refusal stemmed from must have been disposed of either by no conviction or a Level 3, 4, or 5 DWI conviction of which you have complied of the conditions of probation. What is the legal limit in North Carolina? The legal limit in North Carolina is a Blood Alcohol Concentration of under 0.08%. This is the legal limit throughout most of the country. What is the legal limit in North Carolina for a commercial license? The legal limit in North Carolina for a commercial license is a Blood Alcohol Concentration of under 0.04%. This is the legal limit throughout most of the country for a commercial license. What is the legal limit in North Carolina for somebody under 21? In North Carolina, there is a strict no tolerance policy for underage drinking and driving. As a result, an individual who is under 21 cannot have a Blood Alcohol Concentration greater then 0.00%. If I’m over the legal limit, am I automatically guilty? No, you are not automatically guilty. As with any other charge, in order to be guilty, the prosecutor must show that you are guilty beyond a reasonable doubt. This can be done by proving each element of a charge. Although this may be easier if the prosecutor has evidence that you were above the legal limit, that does not mean that your case can not be defended. If you have been charged with a DWI in North Carolina and were over the legal limit, is it in your best interest to hire an attorney. If I blow under the legal limit, can they still arrest me? Although the answer to this question seems like it should be a resounding no, that is not the case. In North Carolina, an individual can still be charged with a DWI, even though they were below the legal limit. This occurs where a police officer has observed an individual driving in a manner the indicates they are impaired. This means that even though they weren’t legally drunk, they were not capable of maintaining their physical and mental capacities enough to drive in a normal manner. Since this type of arrest relies on the subjective opinion of the arresting officer, there exists a better chance of fighting this charge. If you have been charged with a DWI in North Carolina and were under the legal limit, it is in your best interest to hire an attorney. What do police officers look for when searching for drunk drivers? Interestingly, speeding is not generally considered to be a sign of driving while impaired. What if I was stopped for another traffic infraction, but got charged with a DWI? As long as the reason for pulling you over is legitimate, it does not matter if you get charged for Driving While Impaired (DUI) consequently to another traffic violation. Courts have consistently held that routine traffic stops establish probable cause for charging an individual with a DUI. What is the officer looking for when he is interacting with me? What are some of the devices and tests use to determine impairment? Do I have to answer the police officer if he asks me if I have been drinking? Although it is always smart to be cooperative when interacting with law enforcement personnel, you should not give out any incriminating information willingly. If you believe that you may be incriminating yourself by answering the question, you have two choices of answers to respond with. You can ask the officer “Am I being detained?” or state “I would like to speak with an attorney.” Although these answers are within your rights, you should be aware that a police officer may not respond well to these answers and could become more difficult then if you had responded in a more cooperative manner. What tests can the police officer make me undergo? If you have been stopped by a police officer for suspicion of Driving While Impaired (DWI), you may be asked to undergo two types of tests: field sobriety tests and chemical analysis tests. Field sobriety tests are tests that an officer can ask you to perform that display how well you have control of your physical and mental capacities. The more of these tests that you fail, the higher the probability that you are impaired. Additionally, these tests can be used as evidence at trial to prove your impairment. For these tests to be effective, police officers must strictly comply with the required procedures when performing the Standardized Field Sobriety Tests. If your attorney can show that the officer did not strictly comply, doubt can be shown as to your alleged impairment, making it more difficult for the state to prove your guilt at trial. Chemical analysis tests can be: blowing into a breathalyzer, having blood drawn, or providing a urine sample. In North Carolina, as a requirement of obtaining a driver’s license, you have given implied consent for these tests. This means that if you refuse to undergo any of the chemical analysis tests, you license can be immediately revoked for up to a year and you can face additional charges. Can I refuse to take these tests? Yes, you can refuse to take any of these tests. For field sobriety tests, there are no legal consequences of refusing to undergo a test. However, choosing whether or not to take field sobriety tests can be a double-edged sword. By taking a field sobriety exam, you can show both the officer and the court evidence that you are sober. However, if you are not sober, taking theses tests may provide additional proof that you are impaired. As such, taking these tests may help or hinder your case by either providing proof of impairment or sobriety and you should weigh the negatives and positives in deciding. However, for chemical analysis tests, there are legal repercussions for refusing. Since the courts have stated that you have given implied consent as a requirement of obtaining your driver’s license, if you refuse, you will face a revocation of your driver’s license and potentially face additional charges. What evidence does the police officer need to arrest me for a DWI? When considering these three forms of evidence, the officer must decide whether looking at the totality of the circumstances gives him enough probable or reasonable cause to arrest the individual. It is important to note that probable or reasonable cause is a much lower standard of proof then what will be required to show guilt in a trial, which is proof beyond a reasonable doubt. Can I refuse a chemical analysis test? In North Carolina, as a condition of getting a driver’s license, an individual has been considered to have given implied consent undergoing a chemical analysis test. Although implied consent has been given, you may still refuse to undergo a chemical analysis test. However, this refusal comes at a price: the immediate revocation of your driver’s license for a year and potentially extra charges, regardless of the outcome of your DWI charge. What happens if I refuse a chemical analysis? If you choose to refuse to undergo a chemical analysis, your drivers license is immediately revoked for one year by the Department of Motor Vehicles, regardless of the outcome of your DWI trial. Additionally, you may be faced with additional charges for refusing a chemical analysis test. What are some defenses to use in a DWI case? In general, an attorney can challenge your DWI charge by focusing on three different points of the DWI process: the stop, the arrest, and the trial. In focusing on the stop, a police officer must be able to show that there was a reason to stop you. Without a legitimate reason, a police officer cannot stop you. If your attorney can prove there wasn’t a valid reason, your charges may be dismissed. In focusing on the arrest, a police officer must show that there was probable cause ofr your arrest. If the officer cannot show that there is enough reliable information that exists to support a reasonable belief that a person has committed a crime, there is no probable cause. Probable cause is established when looking at the totality of the circumstances: your driving, officer observations, and performance on field sobriety tests and chemical analysis test. Without probable cause, an arrest is invalid and therefore your charges will be dismissed. Finally, in focusing on the trial, an attorney must show that there is no reason for you to be guilty of the charge. This can be done by negating any element of the claim by showing that you are not guilty beyond a reasonable doubt. The reasonable doubt standard is the highest legal standard in our legal system and therefore, the most difficult to prove. Although chemical analysis tests may be one of the prosecutor’s best tools in showing a person was Driving While Impaired (DWI), it can also be hard to defend. If challenged, the prosecution must show that the device has been properly maintained, the person using the device has been certified in using the device, and that the proper procedures for using the device have been used. What are the punishments for a DWI? It is hard to give an exact answer to this question since the punishment for Driving While Impaired (DWI) varies so much depending on the circumstances of each case. Generally, a first time offender will receive a suspended jail sentence, a fine, community service, court costs, a driver’s license suspension of one year, and required attendance at a DWI education course. A jail sentence is required if certain aggravating factors are present. What are the aggravating factors that require jail time? In North Carolina, the presence of certain aggravating factors necessitate a prison or jail sentence. Additionally, if a death occurs during a DWI accident, a Manslaughter or Second Degree Murder charge can be added to the DWI charge. Can my DWI charge be dismissed or reduced? Not likely. 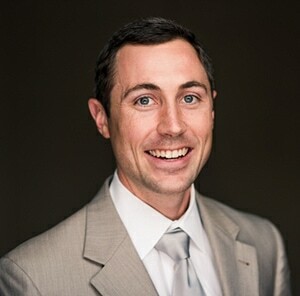 Although some people may believe that they have a chance at getting their DWI charge dismissed or reduce due to a clean driving record or the fact that this is a first time offense, a District Attorney is not likely to drop a DWI charge due to the strict conditions North Carolina law imposes on dropping a DWI charge. In order to drop or reduce a DWI charge, the District Attorney would have to explain why there was a dismissal or reduction in open court and in writing. As such, most District Attorney’s will not even attempt to do so. My DWI blood results have not come back and it has been more than a year, can I get my case dismissed? Probably not. Although the 6th Amendment of the Constitution gives every American the right to a speedy trial, this may not be the situation in North Carolina. Due to budgetary restraints, blood work is taking an exceptionally long time to come back from the central testing facility in Raleigh resulting in especially long wait times in resolving DWI cases involving blood testing. Although this seems to be a violation of your Constitutional rights, most area judges will not deem this to be an appropriate reason for dismissing a case. What is a Federal DWI? A Federal DWI is a DWI that has occurred on Federal property like the Blue Ridge Parkway, a National Park, or Military base. This charge is far different then a normal state issued DWI since it must be taken care of in the Federal court system and is subject to Federal sentencing structures and guidelines. If you have been charged with a Federal DWI, it is important to hire an attorney who is experienced in Federal charges. Can I test positive for alcohol based off non-alcoholic foods or drinks? I got a DWI in NC but I have an out-of-state driver’s license, will my licensing state find out? More then likely, yes. Although there is always the possibility that your arrest will fall through the beauracratic cracks, most states have agreements with other states to share information regarding arrests and driving records through a variety of services available to states. If I’m convicted of a DWI, will my insurance rates jump? After being charged with a DWI, a driver is considered to be dangerous and more likely to cause an accident. As such, insurances companies will raise their rates exponentially to cover their potential liability for your actions. A conviction for a DWI will add 12 points to your insurance record and cause, on average, a 400% increase of your insurance rates. What are the open container laws in North Carolina? Under North Carolina law, it is considered unlawful to have an open container of alcohol in the passenger area of a motor vehicle, including while the vehicle is parked. Commercial vehicles are also not allowed to have closed alcohol containers at all. The legal definition of an open container is any alcoholic container of which the seal of the container is broken. What should I do to prepare for my DWI court date? What are the consequences of being pulled over for a DWI with a child under the age of 18 in the car? If you have been charged with a DWI and a child under the age of 18 was in the car, you are facing a more serious punishments upon conviction. Having a child under the age of 18 immediately bumps the charge up to a Level 1 punishment. This carries a minimum of 30 days and a maximum of 2 years in jail and a fine of $4,000. This is punishment also applies if you have a person who has the mental facilities of a person under 18 or a passenger who is disabled and cannot leave the vehicle without assistance in the car. What are the consequences of blowing a high Blood Alcohol Concentration (BAC)? Can the police use random DWI checkpoint in North Carolina? Yes. Although the use of a random DWI checkpoint seems to be against our Constitutional rights and oddly similar to a brutal police state, the Supreme Court has said that the use of random DWI checkpoints is valid under the Constitution. Although this may be puzzling, the Supreme Court justified this by looking at the amount of crashes and fatalities that result from impaired driving. Since there is a substantial government interest in preventing and reducing these problems, the police were granted the power to set up random DWI checkpoints. If my license is suspended, how am I supposed to get to work? Since a limited driving privilege is not easy to get, it is in your best interest to consult an experienced attorney to attempt to obtain one. What are the costs associated with a DWI? This question is hard to answer since it depends on a variety of circumstances. These are the general costs typically associated with a DWI. What is a 30-Day Civil Revocataion? In what situations will I have to install an Interlock Ignition Device in my car? An individual will have to install an Interlock Ignition Device in their car, regardless of what level they are sentenced to, if they register a 0.15% BAC or higher. The Interlock device will be installed in an individual’s vehicle for at least one year before the individual can obtain their license in North Carolina. The Interlock device must be installed prior to a Limited Driving Privilege (LDP) being granted. For the purposes of LDP, an individual can only drive to and from work, not for any household purposes. An individual must also wait 45 days after their conviction to be eligible for the installation of an Interlock system. How do I obtain an Ignition Interlock Limited Driving Privilege in North Carolina? How do I get a Refusal Limited Driving Privilege in North Carolina? How Do I get A Impaired Driving Limited Driving Privilege in North Carolina? How do I get a Pre-trial Limited Driving Privilege in North Carolina? 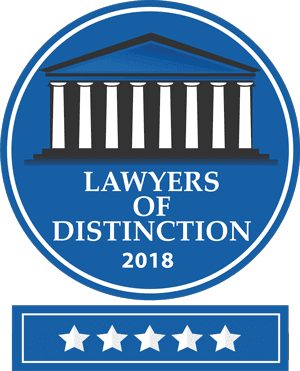 If you have been charged with a crime, it is important to consult with an experienced criminal defense attorney that can help zealously defend your case. Contact Us at Minick Law, P.C. for a free consultation on your case. 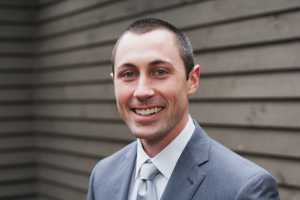 James Minick is founder and C.E.O. of Minick Law, P.C. James is committed to providing top notch legal services through his team of highly specialized legal professionals. James will defend your rights.